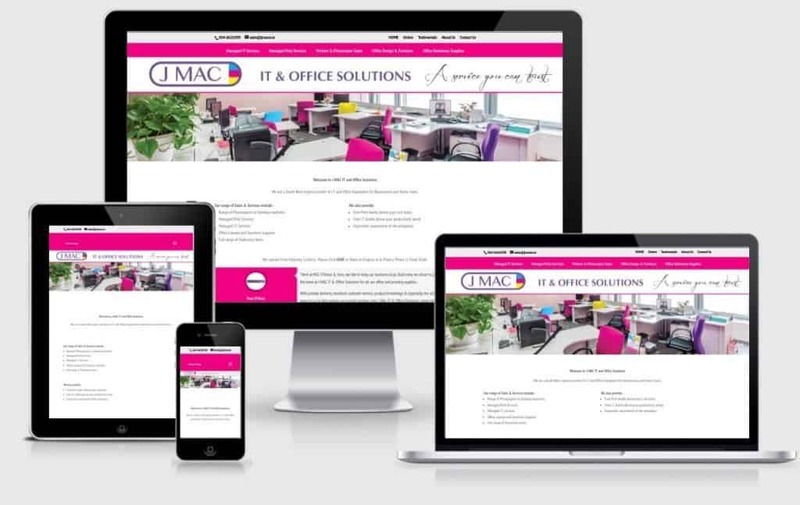 JMAC IT and Office Solutions offer a complete solution for offices including design/layout, fit-outs, ergonomics, equipment, stationery supplies and IT services. While they were an established business, they had not yet had a website built for them, but they were now ready to market themselves online. >> To optimise the website for Google search i.e. to make the website search engine friendly so that those searching for this type of business can easily find it. - Initial homepage prototype submitted to the client, showing the position of all elements; logo, navigational menu, banner, introduction, testimonial slider and footer. - Following approval of the above, the website was built using text and images supplied by the client as well as some stock images to enhance the message that the website was delivering. The branding was maintained throughout the site. - The main goal with the site was to encourage the customer to make contact with the business, therefore we made this as easy as possible by including a contact form at the bottom of each page. Providing a pleasant user experience and making it easy to navigate the site is critical to the success of any website. - Testimonials were obtained from past and existing customers and placed both on the homepage and in a dedicated Testimonials page. - Links to Social Media profiles were included on the contact page. - Because JMACOS was a relatively new business, visibility in the search engines (Google, Yahoo, Bing) was a must and so on-page SEO optimisation was carried out. This included (among other strategies) keyword research and the population of metatags, text, URL’s and images with these keywords. In other words, a search was conducted to see what keywords their potential customers were typing into in a Google search box in order to find the products and services which JMACOS were providing. The site was then populated with these keywords. Many other on-page SEO strategies were adopted, too numerous to list here. We hired Noelle to help us with our Website and Social Media set up & launch. We found her very knowledgeable, helpful and always available to us when needed. She is very trustworthy, committed and gives tremendous value as well. We highly recommend Noelle and her services.